Breaking News: 2019 San Francisco report finds Laura’s Law a success. California debating changing definition of “Gravely Disabled.” Close to 45,000 sign petition urging lawmakers to pass AB 1971. Laura’s Law (Assisted Outpatient Treatment/AOT) and the Mental Health Services Act (MHSA) were both enacted to help the most seriously mentally ill. MHSA funds may be used for individuals in Laura’s Law, but mental health commissioners divert MHSA funds to the highest-functioning, and tell their Boards of Supervisors that they need incremental funds for those in Laura’s Law. This is discrimination against the seriously ill that MHSA was intended for. It explains why the seriously mentally ill in California are sent to shelters, jails, prisons and morgues rather than treatment in spite of the over $1.5 billion raised annually by MHSA. This site details Laura’s Law and MHSA and provides county by county information. Why is public in dark about this? $11 million in MHSA funds went to hire a P.R. firm that works to convince the media that all is well. They continually issue press releases and call editorial boards to extol the virtues of the program. County mental health directors and recipients of the diverted funds benefit from the status quo and therefore defend it. Governor Brown, former state Senator Steinberg and his successors appointed recipients of MHSA funds to sit on the Oversight Commission. As a result of this conflict, MHSA is being overseen by beneficiaries of funds and cheerleaders for mission creep, rather than stewards of the public purse. This is not what voters wanted to happen or were told would happen. Money is not the issue. Leadership is. Who is responsible for MHSA failures? Misspending on MHSA – Jaffe, SD Union Trib. MHSA audit shows problems – Kazakoff, SF Chron. Audit finds funds for mental health services misspent – Yanello SF Chron. 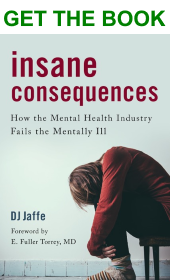 SF Chronicle: Mental “health” industry diverts MHSA – SF Chron.